The Jeep Cherokee is a popular small crossover that offers Jeep capability with on-road comfort and everyday usability. For 2019, the Cherokee sees a full revamp that includes a new exterior look, a third engine option and more interior ergonomics. The 2019 Jeep Cherokee is the second Jeep crossover to receive a new look, following the redone Compass. The Cherokee's new look now falls in line between the smaller Compass and the larger Grand Cherokee. A small crossover-SUV with seating for five, the 2019 Cherokee comes in five trim levels with either front-wheel or all-wheel drive in most. Three engine choices are all mated to a nine-speed automatic transmission. The 2019 Jeep Cherokee was unveiled in Detroit at the North American International Auto Show in January 2018 where its new body design was a hit. 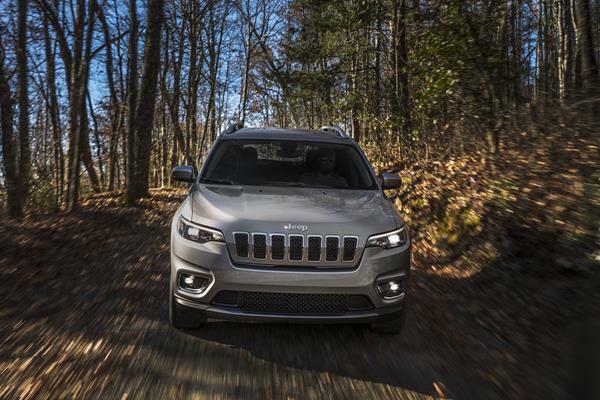 The narrow front fascia of the previous Cherokee was gone, replaced with a more Jeep-contemporary, flat-faced slotted grille matching the larger Grand Cherokee and smaller Compass. Similarly, body lines are simplified and more contemporary, while the rear hatch is less bulbous and more flatly smooth. The 2019 Cherokee's overall look resembles a wider, more well-balanced crossover. LED lighting is added to the tail lamps for a more upscale look and composite materials makeup the tailgate to lighten its load. The rear tailgate's release handle is now just above the license plate holder rather than down near the bumper as before. The new look for the 2019 Jeep Cherokee is much more palatable to a larger audience than was the previous design. Most of the Jeep elements, such as trapezoidal wheel wells, added trim to enhance the appearance of ground and tire clearance, and accessorized tow pins are still on the Cherokee. 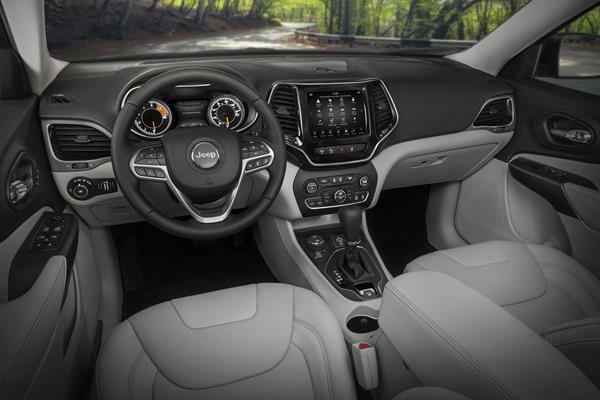 The 2019 Jeep Cherokee has a much-improved interior for what was already a very well-done design from the previous generation. Major changes start with a less bulky center stack, more usable cargo space and more roominess in general. Upscale design elements like a larger variety in trim materials are also seen in the new Cherokee. 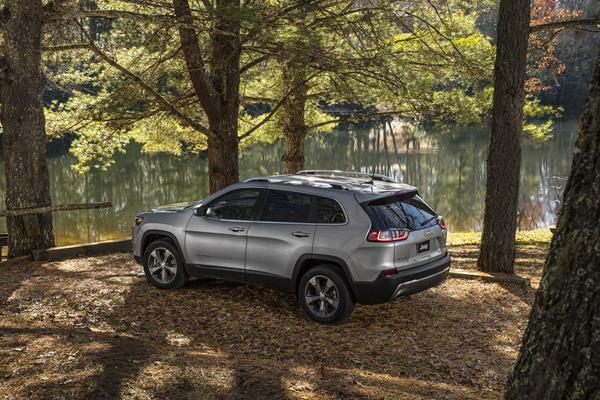 The driver and front passenger have the same excellent comfort found in past Cherokees, with accommodating seating that offers plenty of legroom and headroom. The rear seat has good outboard positions and more center seat room than might be expected of a vehicle the Cherokee's size. The more refined center stack offers a more streamlined look that has better climate venting and a nicer bezel design around the infotainment. The dashboard is higher and more forward, giving more leg and knee room for the front passengers, and added gadget storage such as the slot near the USB plugs are nice touches. A split-fold rear bench is standard and now folds almost completely flat for easier cargo loading. 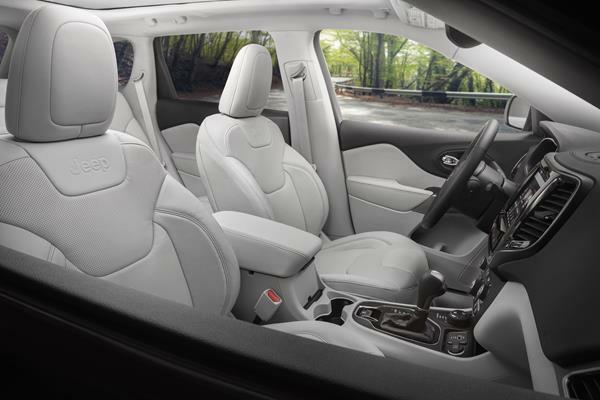 Better placement of the LATCH anchors makes it easier to install child safety seats in the new Cherokee. Cargo space is measured at 25.8 cubic feet behind the rear seats and 54.9 cubic feet when those seats are folded. Side pockets in the rear are large enough for a milk jug and tie-down placements are intelligently done. Technology in the new 2019 Cherokee is well done. Based on Chrysler's Uconnect system, the infotainment found in the new Cherokee is some of the best on the market. The base model comes with basic infotainment in a smaller screen with Bluetooth, Android Auto and Apple CarPlay. Upgrading to the more premium options brings WiFi connectivity/hotspot option, speech-to-text and more. Plugs are easy to find in the 2019 Jeep Cherokee, especially with the infotainment/navigation upgrades. So are advanced driver's aids, which come in separate packages or trim point upgrades. Fuel economy in the new Jeep Cherokee depends on the engine and drivetrain chosen. The base engine is offered with both front-wheel and four-wheel drive. In FWD, it is EPA-rated at 25 mpg combined and at 24 mpg combined in 4WD. A new upgrade turbocharged four-cylinder engine is now offered in the 2019 Cherokee, offering 26 mpg combined in FWD and 25 mpg combined in 4WD. The V6 engine offering has an EPA rating of 23 mpg in FWD and 22 mpg in 4WD. These are all roughly average numbers for the segment. There isn't much data to go with for the 2019 Jeep Cherokee's reliability ratings. As of this writing, J.D. Power and Associates have no yet released Vehicle Dependability Study results for 2019 model year vehicles. There has been one recall for engine cooling issues with the new turbocharged engine offering. That recall only affected 14 sold units, so it's not a major one. The 2019 Cherokee's warranty is about average for the segment at 3 years/36,000 miles bumper-to-bumper and 5 years/60,000-miles on the powertrain. The 2019 Cherokee has yet to be crash tested with published results from the National Highway Traffic Safety Administration (NHTSA) or the Insurance Institute for Highway Safety (IIHS). The previous generation did well on crash tests and we suspect the new-generation Cherokee will improve on those numbers. Some models include advanced crash avoidance technologies, which have rated well in past IIHS testing. 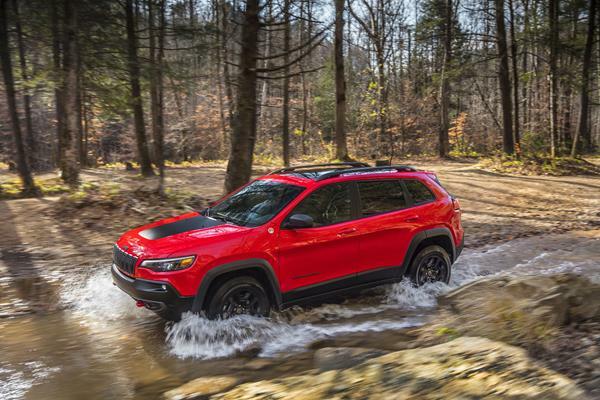 New for 2019 is a 2.0-liter turbocharged four-cylinder engine that joins the Cherokee's other base four-cylinder and V6. All three engines are mated to a nine-speed automatic transmission turning either the front wheels or all four in four-wheel drive. The turbo-four and V6 are both offered with the Freedom Drive I and II transmission options for four-wheel drive while the base four has only FD1. The base engine is the same stalwart 2.4-liter inline-four that's powered several Chrysler-Jeep-Dodge vehicles for years. This engine is barely enough to motivate the Cherokee and is rarely purchased. Most will be willing to upgrade, especially given the low cost of the turbo-four. That turbocharged engine is a new 2.0-liter four-banger that outputs 270 horsepower and 295 pound-feet of torque. Towing with this setup is rated at 4,000 pounds. Not too shabby for a four-cylinder offering that's also punchy and fast paced. The V6 is the same 3.6-liter that's been in the Jeep lineup for a long time. This well-done engine outputs steady power that peaks at 271 horses and 239 pound-feet. Its tow rating is slightly higher than the 2.0t at 4,500 pounds, and it delivers power in a more even curve. The buyer's choice of engines will likely hang between the turbocharged four and the six-cylinder engine. The ultimate choice will be largely about taste, though the V6 will likely have better resale down the road. The 2019 Jeep Cherokee offers a smooth drive in most configurations and situations. Off the road, the power of the turbocharged engine brings fast torque, while daily driving is enhanced with good long-term power delivery from the V6. 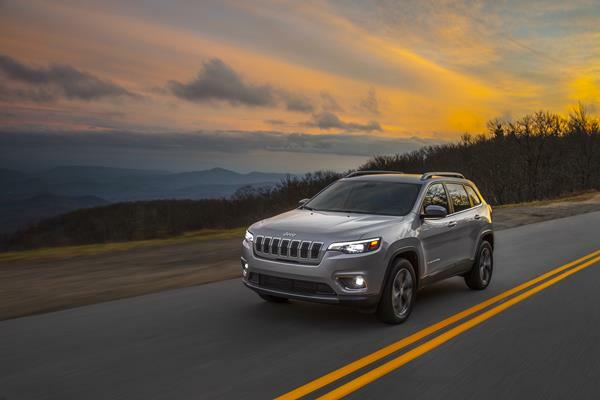 On the highway, the 2019 Cherokee is smooth and quiet with an upscale feel. The 2019 Jeep Cherokee is priced well at its base point, but most buyers are likely to end up in the middle-tier trim points. The top-trim Cherokee is probably not worth the money, given the competition and some of their higher-end offerings for the same dollars. In the middle and off-road (Trailhawk) trims, the 2019 Cherokee is a great deal. For about $30,000, you can get a well-fit 2019 Cherokee with plenty of technology, safety and other options included. The interior's comfort and roominess are the same across the board, only with details like the number of USB plugs changing with each trim level. Driver convenience jumps drastically in the Limited model, where most buyers will likely find their comfort zone in terms of price for the accouterments. Resale with the V6 engine is likely to be higher than the new turbocharged engine, but that could change with time as the turbo-four gets vetted with use. The base four-cylinder model generally does not do well in the aftermarket. Unless price is your ultimate decider, we'd steer clear of the Latitude and Latitude Plus models with the base four-cylinder. Competition in the two-row, small crossover market is thick with good options. The 2019 Jeep Cherokee finds itself pitted against best-sellers like the Honda CR-V and Toyota RAV4, neither of which offer the Cherokee's off-pavement credibility. The CR-V is a good choice for interior roominess and cargo, but lacks the driveability and upscale appeal of the Cherokee. The RAV4 is polarizing in its design and offers little of what the Cherokee does otherwise. Other good choices in the segment include the Mazda CX-5, which has an excellent interior, extremely sporty drive appeal and great exterior looks at a similar price point. Similarly, the Subaru Outback and Forester models can compete with the Cherokee in some respects, especially off-road capability, but are not as roomy or appealing. The 2019 Jeep Cherokee is a great choice for many buyers given its excellent off-road and all-weather capability, large interior and good daily drive feel. Because the Jeep shies away from the Euro-market look of many crossovers on today's market, it appeals in that way as well. The 2019 Cherokee is a great choice in a competitive segment. We feel that its current rating will raise as more information about reliability and other unknowns become available. Interested to see how the 2019 Jeep Cherokee ranks against similar cars in terms of key attributes? Here are the 2019 Jeep Cherokee rankings for MPG, horsepower, torque, leg room, head room, shoulder room, hip room and so forth.